31.10.2014. An International Investment Forum “Georgia – Regional Hub and Asia’s Gateway to Europe” took place in Tbilisi on October 29-30, jointly organized by the Ministry of Economy and Sustainable Development of Georgia and the Asian Development Bank (ADB). The Forum, held at the hotel Radisson Blu Iveria, hosted over 300 guests from diverse sectors and countries, ranging from private, international and domestic companies to large international business associations, including the American Chamber of Commerce in Georgia (AmCham Georgia), the largest international business association in Georgia, with up to 160 members. The PM, in his speech Why Georgia Matters, emphasized Georgia’s role in the region and the importance of the recently signed Association Agreement with the EU, as well as the Deep and Comprehensive Free Trade Area/Agreement (DCFTA), which “opens vast opportunities” for Georgia while turning it into an increasingly important business center in the region. Andrew Coxshall, Managing Partner of KMPG in Georgia, a provider company of audit, tax and advisory services to major Georgian and global companies, underlined the positive political and economic transformations in Georgia. “Over the last twenty-five years Georgia has witnessed massive changes, both positive and negative. But in recent years, the country has undergone an economic and political transformation which now means that Georgia has one of the healthiest economies and best democratic credentials not just in the Caucasus but in the wider region,” said Coxshall. There were issues reviewed, such as manufacturing, transport & logistics, energy, large-scale infrastructure projects as well as tourism, within the panel discussions by one of the Forum;s key speakers Giorgi Kvirikashvili, Minister of Economy and Sustainable Development of Georgia. The Minister described Georgia as a place providing significant investment opportunities bringing Asia to Europe through intensive cooperation and developing jointly beneficial projects and connections. In addition, there were separately held panel discussion on tourism, logistics and manufacturing engaged in by Mikheil Janelidze, Vice Minister of Economy and Sustainable Development of Georgia and other key speakers from numerous institutions. Talking about Georgia’s energy and its transit function in the region was one of the main points of the Forum, as the country has great capabilities in this direction, particularly in the Baku-Tbilisi-Ceyhan Oil Pipeline and other strategically important economic projects, such as Anaklia (Lazika) Sea Port and Baku-Karsi-Akhalkalaki Railway. 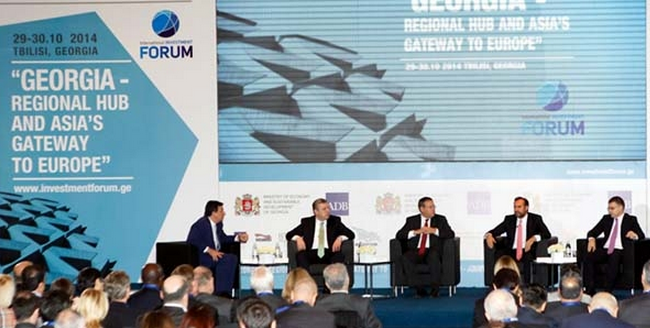 Ultimately, the platform afforded by the Forum was designed to assure potential investors of Georgia’s potential in various sectors and to attract more foreign direct investments.